In true rebel farm(ish) girl style, I thought I should let you in on a little secret: We don’t use chick starter at our farm (for chickens or pheasants) and we haven’t for the last four years. Wondering why? Pull up a chair. Reasons we don’t use chick starter: the guy at the feed store told us we didn’t need to. My heart rate elevated. Here this dude was telling me something different than what I’d read in all the blogs and books I’d used for solid research. How dare he? I filed his advice in my brain…and kept buying starter. But then I started talking to more people. Reasons we don’t use chick starter: 50 years ago, chick starter wasn’t a “thing”. 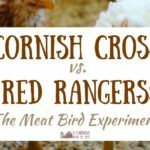 Research online doesn’t give any easy answers about when the practice of feeding chick “starter” began, but I can tell you that the more long time farmers/homesteaders I talk to, the more I get the impression that a good majority of them regard chick starter as more of a “thing” than a nutritional requirement. It seems to me that as time goes on and research is done, the proper care and feeding of chickens becomes more complicated instead of less so. 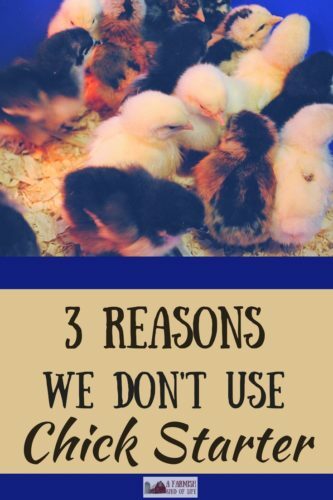 While working on this piece, I came across several articles that stated chicks should not eat layer food, layers should not eat chick food, and rooster companions to egg-laying hens should be eating a completely different feed of their own. In a real-life, multi-age, free range flock—the kind we think of when we picture Normal Rockwell-esque farms—I’m not sure how this segregated feeding is even possible. Reasons we don’t use chick starter: when chicks follow Mama Hen around, they eat what she eats. When our chickens were free range, we would often have a lot of surprise hatches. I did not (and still don’t) separate mama and her babies from the rest of the flock – 99% of the time we’ve seen mama prove she can hold her own. Those little fluffballs follow mama wherever she goes, doing what she does, and eating what she eats. I have never had a chick die from eating layer feed. Ever. I’ve never had a chick starve from not being able to process layer feed. Ever. A survey of fellow homesteaders revealed there are many farmish folk who don’t use starter. One homesteader commented their local feed store doesn’t carry non-medicated starter, so they just opt not to use starter at all. 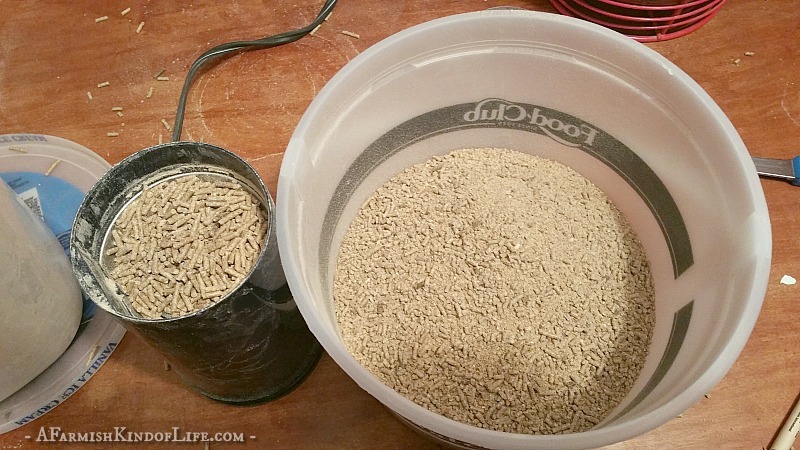 Another homesteader said she simply doesn’t have the room to store several different kinds of feed, and so her whole flock gets the same kind. Yet another homesteader commented that the protein difference in the starter and layer crumbles available in her area is a “whopping” 1%, so she figured it was easier to buy the layer feed for everyone and be done. For instance, the game bird grower we buy for our pheasants is pretty large, so we will grind it for the babies for a couple weeks. Some people argue that you don’t even have to do this, and that the chicks will be just fine pecking at the large crumbles. 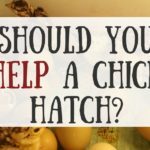 If you don’t use chick starter and you’re worried about lower protein by not feeding a chick starter, realize there are many ways you can supplement protein. Try scrambled eggs, meal worms, and other things as a protein boost for all the birds in your flock. Some folks say that the issue with chicks eating layer feed isn’t the lower protein, it’s actually that the calcium content is too high for chicks to process. Layer feed can have as much as 3% more calcium than its starter equivalent. A laying hen uses that extra calcium to create strong egg shells. If higher levels of calcium are given to chickens who aren’t laying, some sources suggest it could cause stress as their kidneys work to filter the calcium out. Do with this information what you will. To suggest that chicks are prone to kidney failure because they get too much calcium suggests I would see chicks keeling over from kidney failure, or growing up to mope around my farm with debilitating health issues. I haven’t seen it yet, folks. So, as a rebel farm(ish) girl, I’m just going to point this out: I’m not telling you that you shouldn’t feed starter. I’m telling you that we don’t feed starter. A great post, thank you! I was just thinking along the same lines. We also choose to mix our own layer feed and not do the pellets. They seem to be doing fine so far except for the hens who can’t keep up with the bigger ones when it comes to getting eggs shells from the compost and have a few chest feathers missing. They free range on about a 1/2 acre and seem to get most of what they need. We use organic hard wheat, organic field peas, Organic rye and organic unhealed oats from Azure. When we bought our premixed organic feed they would leave all the crumbly vitamins and extras and kick them all over their coop so we figured they were not eating it any how and yet we were still paying for it! I have a ‘how to feed chicken book’ from the 40’s on my to do list, should be interesting! Love this, and giving some more thought to what my chicks are eating now. I pay extra at the feed store just to buy Non-medicated chick starter, but the layer feed typically doesn’t contain meds so I think I have found a new “thing” Thank you! This is interesting to read Amy, thanks for the info! We have fed our meat bird chicks scrambled eggs along with starter, but we should skip the starter next time. I need to get a worm farm going for this coming summer, since we will be doing meat birds again! I also keep baby with mom and they all free range. I just put layer feed in a plastic baggie and use a rolling pin to crush it up. Never had a problem. I have no choice but letting my mama hen dictate what her babies eat. Mama hen does not accept starter neither any pellets mixed in layer. she forages whole day and when it comes to other stuff they only accept eggs and macadamia nuts. I tried sesame seeds, sunflower kernel, brewers yeast, organic wheat, oats etc. I read all kind of magic recipes but all wasted. Here in Queensland I have to keep them in enclosed yard due to predators. I do take them for a tour outside but watch them closely. Friends of ours only use “grower” feed for their flock as they also have read that excess calcium may be harmful to roosters. Is this the same thing as starter? Thanks for this! I mix our own feed and have been wondering what I would do for the babies this year. I didn’t really want to spend $28+ per 50lb sack of starter food. Our whole flock gets a “grower” mix and we have egg shells and calcium out for them free choice. Seems to work so far. Cool, I like your blog. I normally don’t use chick starter either. I just feed everyone layers crumbles and scratch. They’re free range and like to help the pigs out with their food as well. I’ve never had any problems with the health of my chickens. My chicks haven’t gotten sick or died. I have had a few chicks eat a big size pig food pellet and have to wiggle their necks around to get it to move into their stomach. However, with my Serama chicks, I use chick starter. It’s easier for me to not have to grind up the food. But I just feed the chick starter to everyone for the short time I’m using it. I have been feeding layer crumbles (they don’t like pellets) and scratch. I had two surprise hatches and because I have too many predators, I separated mamas and broods into a predator proof enclosure. They got the same feed as everyone else, they are all growing like weeds and I will most likely be butchering 2/3 of them as soon as they start crowing! I am going to try to grow redworms for them this winter as well as sprouting some kind of grain. We have a hard time getting barley and oats doesn’t sprout well. I am trying to figure out what to sprout that the horse can eat as well. Thank you for this! 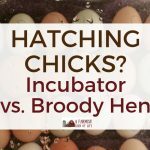 I go natural and put fertile eggs under my broody hens. I have been “chick starter” shamed in the past. Now I am going to post this to Facebook and sit back to raise my chicks naturally. I am such a mean chicken mom…they don’t even have a swing! My layers and their chicks are pasture raised. The hens have a feeder of whole wheat, one of oyster shell and another of grit. 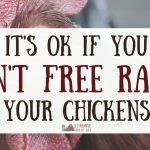 Found an article from Manitoba Agriculture on free choice and how chickens can moderate their diet. And an article from 1945! The day olds get scrambled eggs & I grind some of the wheat for the chicks. Thank you for the straight talk. We were in the business 26 years ago and lost it all with a massive storm. A few years ago we started back and noticed the same thing with our yard birds. So this time we went organic and everyone gets the same feed. The only thing we have noticed is we far less stressed birds or sudden flock decline. Food? Medicine? Vitamins? Natural Farming has saved us money and increased profits so far. One caveat perhaps the 3% extra calcium in the layer has a untoward result in cooped only birds. So I just read your very interesting article! I am all for not using starter (thanks) but I do have a question as my baby chicks were not vaccinated. Do I need to worry about that? I got fertile eggs from a farm(ish) gal down the road aways to give to my broody hen. They are now 14 days old and have been eating chick starter/grower but PeasyMom hates it!!! Advice welcome! I love it! Life doesn’t have to be complicated and we don’t have to fear the unknown … even in issues as tiny as a chick 🙂 Thank you! I got some fresh chickpeas today and the local hardware store was out of chick starter so I gave them layer crumble and prayed they would be ok until I could grab starter … now I feel better! I am interesting in learning, and following old methods. As a believer in the Bible, the Holy Scriptures, I believe the best practices were those followed by Adam and Even and a few others. 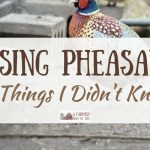 Are you able to shed any light on the practice of feeding chickens a few hundred years ago by indigenous tribes throughout the world? Hi! I recently ran out of chick starter and my babies are already 5 weeks old, so we had recently bought a 50 pound bag of laying hen pellets. Could I crush them up a bit and feed them that instead of chick starter? For every one “saving” a few bucks on not buying starter. Yes you really are damaging your birds innards. No you will not see them dying left and right either. Their lives will be shortened. Think about it this way ; would you feed a newborn human baby your aduld diet? I would hope not. You both have different requirements for growth and energy. *Babies need that protein start for growth! *Pullets need some protein to finish filling out and a bit more calcium to put away into her bones and body before she starts laying. *Hens don’t need that higher protein. They still need their level to make those eggs. She needs higher energy (fat) in her diet to make those eggs. She needs that higher calcium for her bones and body because that’s where she pulls that calcium to make those shells on the eggs. *Roosters will be damaged by the higher calcium diets as well. He isn’t making eggs, his kidneys just can’t handle it. These special bags of feed weren’t created for fun. Different age birds and sexes and speices have different nutrient requirements. If you decide to ignore that, that’s up to you. What you can expect from not feeding an optimal diet is a shortened live span, more diarrhea at certain age levels, stunted growth in body and feather coat and unexpected deaths from “healthy” looking birds. Their isn’t a fault in letting a hen raise her chicks either without starter, however you can still expect the same result as not feeding a starter too. Not to mention that broody hen has been nearly starving herself where that starter diet is helpful to her to regain her loss body mass and feathers (she’ll have kicked her body into a molt by sitting on eggs) because of the extra protein in the starter. Folks can do whatever they want. I’m just telling you what we do.